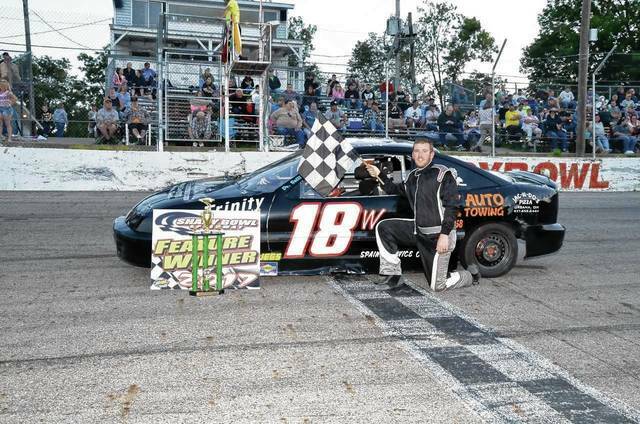 DeGRAFF – Seven different drivers posted feature wins at Shady Bowl Speedway on Saturday. It was double points night for all divisions making for some aggressive and close racing action. Caleb Reschar led the 35-lap late model feature before giving way to Matthew Parsons. Dayton’s Don Mahaffey Jr. made his way to Parson’s bumper, setting the stage for a great battle between the two former track champions. Three-time feature winner Mahaffey, who set fast time, passed Parsons on lap 12 to take over the point. Parsons pressured Mahaffey the final laps but was unable to regain the lead. Parsons was second with Jesse Gade, Jim Lewis Jr. and Caleb Reschar following Mahaffey’s Quick Parts sponsored stocker. Mathew Parsons was the dash winner, with Kenny George Jr. winning the heat. Mahaffey and Gade finished in a tie for the Amsoil Hard Charger award. Don Skaggs led the field into turn one at the drop of the green flag for the 30-lap modified feature. Skaggs’ lead lasted all of one lap before Brad Yelton powered by. Yelton set sail for the feature win, but fast qualifier Shane Shirk was determined to take the lead. The two set a torrid pace before Yelton in his Redskin Motor Sports owned Boerger Electric backed open wheeler took the checkered for the second time this season. Rob Yelton, Brian Brandyberry and Logan McPherson rounded out the top five. Daniel McPherson carried the checkered for the dash, with Carl Stapleton taking the heat win. The DeGraff Service Center Hard Charger award ended in a tie, with five drivers earning the same amount of points. In street stock action, Shawn Stansell took the lead from Josh Longstreth on lap 10. He then had his hands full as he fought off the challenges of Piqua’s Josh Sage. Stansell took the checkered at the end of the 25-lap feature, with Sage crossing the line second. However, Stansell’s car failed a post race inspection and he was disqualified. The final rundown had Sage as the winner in his Lunch Box Truck Service sponsored ride. The win was the second in a row for Sage. Rodney Roush, Longstreth, Jason Parsons and Jacob Heckman rounded out the top five. Sage set quick time, with Rodney Roush taking the dash checkered and Richard Roush the heat. Sage made it a clean sweep, as he also won the Ohlinger Automotive Service Hard Charger award. The 20-lap compact feature turned out to be a great one for Cody Wynn as the North Lewisburg resident led all the way to notch his first ever career feature win in his Kirby Auto Parts backed car. Josh Foltz was second and won the dash and the Quick Parts Hard Charger award. Jimmy McElfresh was third, with Mike Wintrow fourth and heat winner Dusty Harding fifth. The super compacts were also on the schedule. Riverside driver Bo Hoelscher won every event he entered for a clean sweep. He won the 20-lap feature, the dash and set fast time. Terry Eaton Jr., Eddie Kemp, Austin Eaton and heat winner Joe Jennings finished second through fifth. Foltz won the Quick Parts Hard Charger award. The 10-lap stock pure main event was won by Zack Brandenberry in the Bryant Automotive and Transmission Chevy. Zach Doolin was second, with John Eastman third and Ryan Tamburro fourth. Jason Purtee was the fast qualifier. Corey Plunkett edged out Chad Owens to win the spectator drag race. This Saturday night will be the annual Neal Sceva Memorial for the late models. The feature will be 82 laps. There will also be a 51-lap street stock feature. The pure stocks, compacts and super compacts will also be on the schedule. Racing will start at 7 p.m.